Cannot be Normal Summoned/Set. Must be Special Summoned (from your hand) by banishing all LIGHT monsters or all DARK monsters from your Graveyard, while you have an equal number of each in your Graveyard, and cannot be Special Summoned by other ways. While face-up on the field, this card is also LIGHT-Attribute. When this card is Special Summoned: You can activate the appropriate effect, based on the Attribute of the monsters banished for the Special Summon. You cannot conduct your Battle Phase the turn you activate this effect. ● LIGHT: Target 1 monster on the field; banish it. ● DARK: Banish 1 random card from your opponent’s hand face-down, until your opponent’s End Phase. Black Luster Soldier-Envoy of the Evening Twilight has a very long name. He’s a Level 8 Dark Warrior-type monster with 3000 Atk and 2500 Def. He has nice big stats good for the field or Trade-In or Allure. The Allure option is the only thing that makes this better than the original. Otherwise, do not ever run this instead of the original. The original at least has some support. This doesn’t let you conduct your Battle Phase when you use its effect. It only gains the effect when Special Summoned. It can only be Special Summoned while you have an equal number of Lights and Darks in the grave, banishing all of one of those attributes from the grave, and then by no other ways. For all that trouble you can banish a targeted monster (banished Lights for Special Summon) or banish a card face-down from your opponents hand until the End Phase (banished Darks instead). You can never get both effects. They both aren’t great, and the original is better. The too long name card is for collectors. Throw this one back in the binder. When you are associated with something like Black Luster Soldier – Envoy of the Beginning, the bar will be high for you to reach and I don’t know if Envoy of the Evening Twilight reaches the bar its predecessor reached. EotET is a Level 8 DARK Warrior with 3000 ATK and 2500 DEF. Stats are good, just like how they are good on EotB. DARK is a great attribute and Warrior is a solid type, though better on a Level 4 or lower than it is on a Level 8. EotET cannot be Normal Summoned or Set and can only be Special Summoned by all LIGHT or DARK monsters in your GY while you have an equal number of them. Very restrictive on how you can summon this, having an even number of LIGHTs and DARKs can be hard, so EotET is already off to a disadvantage. While it is on the field, it is also treated as a LIGHT attribute in case you need something like Honest. 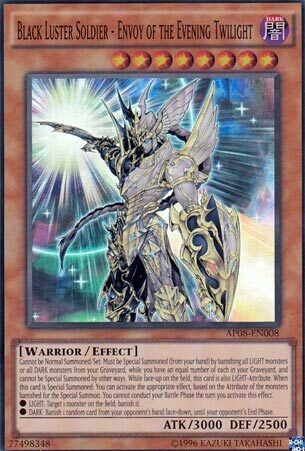 When this card is Special Summoned, you can gain one of the following effects based on the monsters banished to Special Summon this thing, but you cannot conduct the Battle Phase that turn. LIGHT: Target a monster on the field and banish it. DARK: Banish 1 random card from the opponents hand face-down until the End Phase of your opponent’s turn. Both effect could of been better considering the specific requirements to summon this thing. For LIGHTs, this did not need to target, but it was designed before targeting became more of thing that cards had protection against. For DARK, the card could of been banished forever. Considering how much GY management you have to go through to get this thing on the field, the effects could of been better, and it could of just prevented himself from attacking this turn. The card is too restrictive if you ask me, not worth running considering Envoy of the Beginning is at three now. Art: 4/5 He does have nice art, I will give him that. Here, a key difference to start, you Special Summon this card by removing ALL Light or Dark Monsters in your Graveyard from play. So, if you do this early, it could be as few as one. But the big factor here is, you have to have an equal number of Light and Dark in the Graveyard to be able to Special Summon him. He also gets his effect when Special Summoned, as opposed to his other Envoy counterpart, depending on whether you removed Light or Dark Monsters. If Light, you target a Monster on the Field and remove it from play. If Dark, you remove from play a card from your opponent’s Hand at random, until the End Phase. In short, sadly, this card is just a shadow of his former self. No double attack, you only get the removal once, where the other BLS can every turn if he needs to. He could be easy to summon, he’s still got 3000 attack, but neither of his effects are good enough to run him. Especially when Envoy of the Beginning is sitting here at 3 being ignored. Hell, Black Luster Soldier-Super Soldier is better than this, and it’s a Ritual. Next articleYu-Gi-Oh! Funko Pops! Coming Soon!